Farfield Mill is situated near the Howgill Fells between the Yorkshire Dales National Park and the Lake District. One of thirty seven designations within the Yorkshire Dales National Park, Farfield Mill was given conservation status in March 1993. 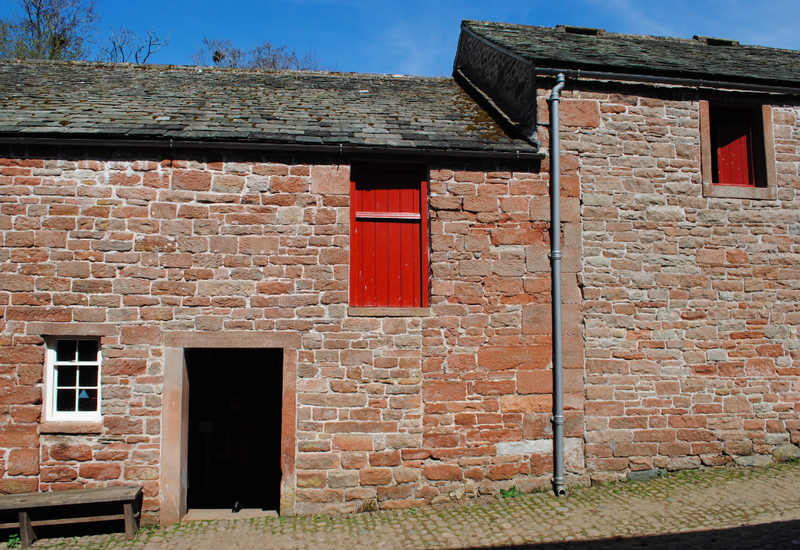 The first mill building was constructed in 1837 for Joseph Dover, who was originally a merchant from Keswick, to card and spin wool. 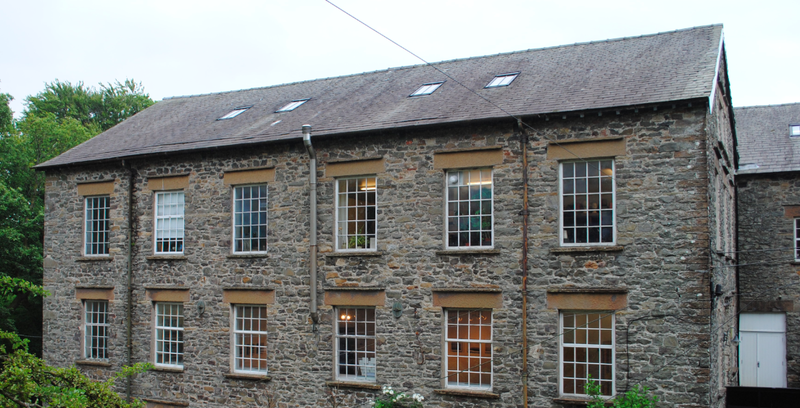 Farfield was one of five water powered woollen textile mills which were an important part of the economy of the Sedbergh area in the 19th century. The associated cluster of historic buildings, cottages and owner’s houses were also added during the 19th century. The Dover family continued to run the business until 1935 when Edward and Thomas Dover both died with no direct descendants. In 1937 the complex was sold to Thomas Histler, a builders merchant, and Robert Johnson, a carpet manufacturer. The mill was subsequently used for manufacturing crankcases for Airspeed Oxford Trainer planes during World War II and the buildings were requisitioned by the Admiralty for storage. The mill was then returned to a West Riding based spinning company, Batty Bros, in 1953. Textile manufacture once again resumed in 1965 and continued until 1992. One building, and two working Dobcross looms it contained which had been installed in the 1960s, was purchased by the then Sedbergh and District Buildings Preservation Trust in 1998 and now houses an Arts and Heritage Centre. Typical of the period in which the buildings were constructed, the architecture reflects the social hierarchy and function. The stone buildings consist of simple detailing and regimented rows of windows which provide well lit open spaces. The original mill building is three bays wide and nine bays long and is built into the slope being two storeys high at eaves level and three storeys high at the edge of the river. Many of the original iron support pillars, by Lound foundry of Kendal, survive as do many of the wooden floors. The coursed rubble building features a queen truss roof capped with Westmorland slate and sandstone lintels. Within the Heritage display on Level 2 is a 300 year old Witney Blanket Loom (above). One of the earliest of its type, it has a flying shuttle and was invented during the Industrial Revolution. 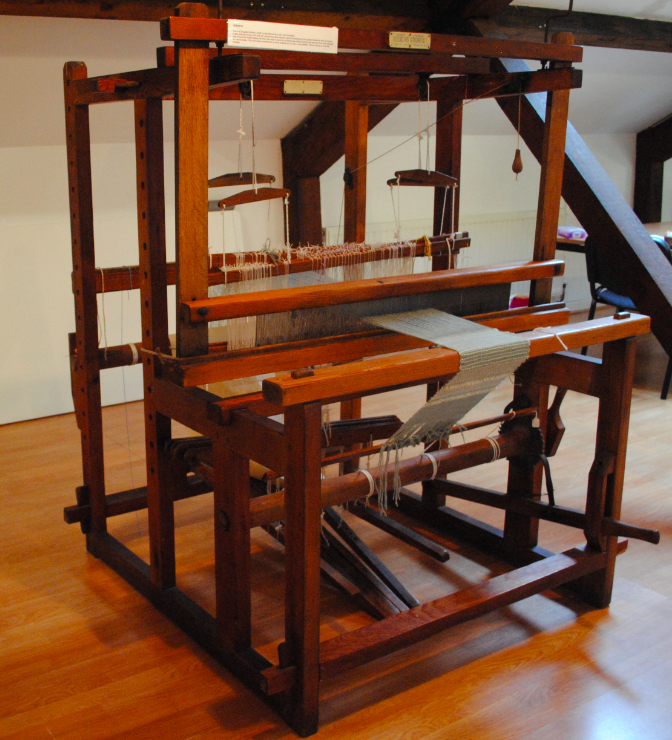 It is a timber framed four heddle hand loom with the flying shuttle mechanism added around 1800. The loom was used to weave horse collar check and woollen blankets since 1702. 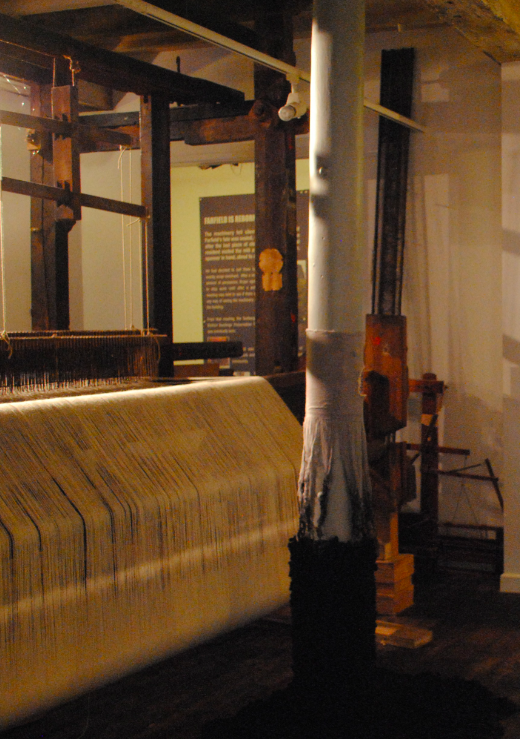 The loom stands over 9 feet high and was donated by The Early’s Archive Trust who closed in 2002 when the loom was offered to Farfield Mill. 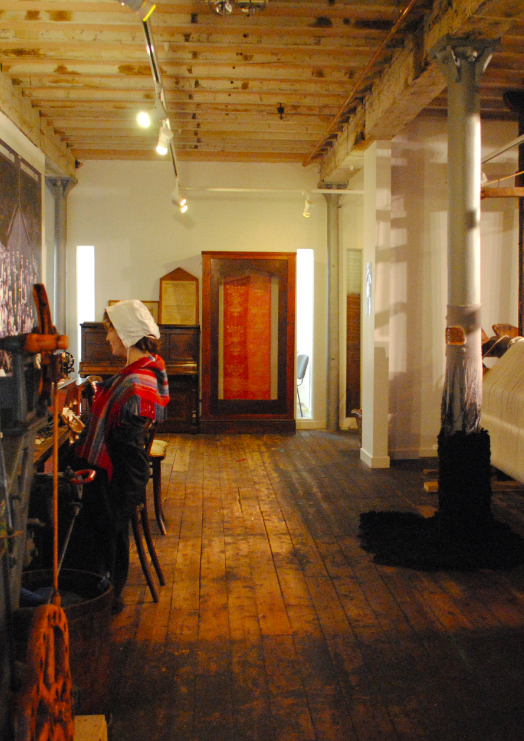 Sponsored by the Heritage Lottery Fund, Level 2 displays the Living History Heritage exhibition created by local people and dedicated to the rise and eventual demise of the Victorian woollen and textile industry in the Sedbergh area. 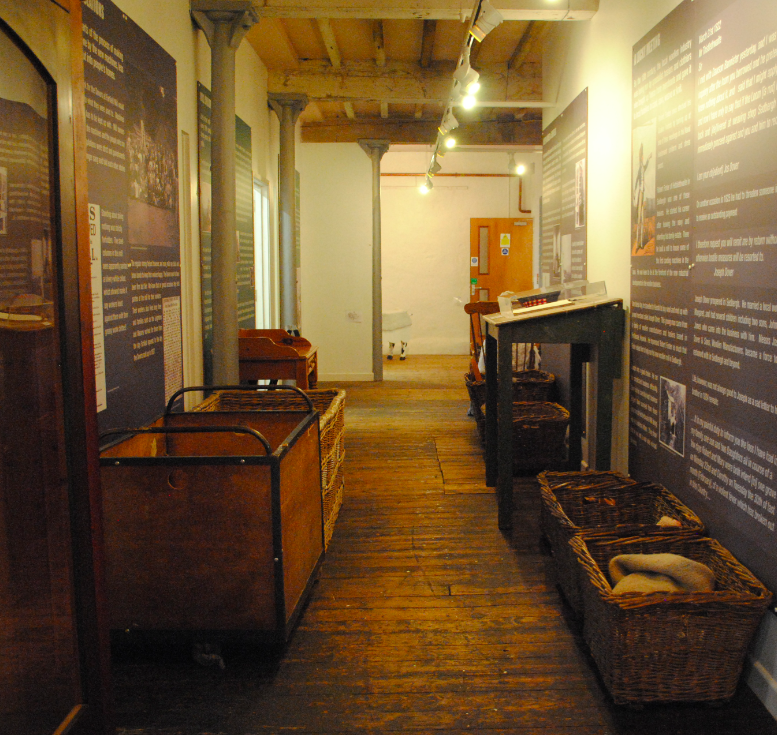 Examples of the processes used at the mill from 1911 onwards are displayed throughout Level 2 and the dangerous conditions those employed at Farfield are highlighted. 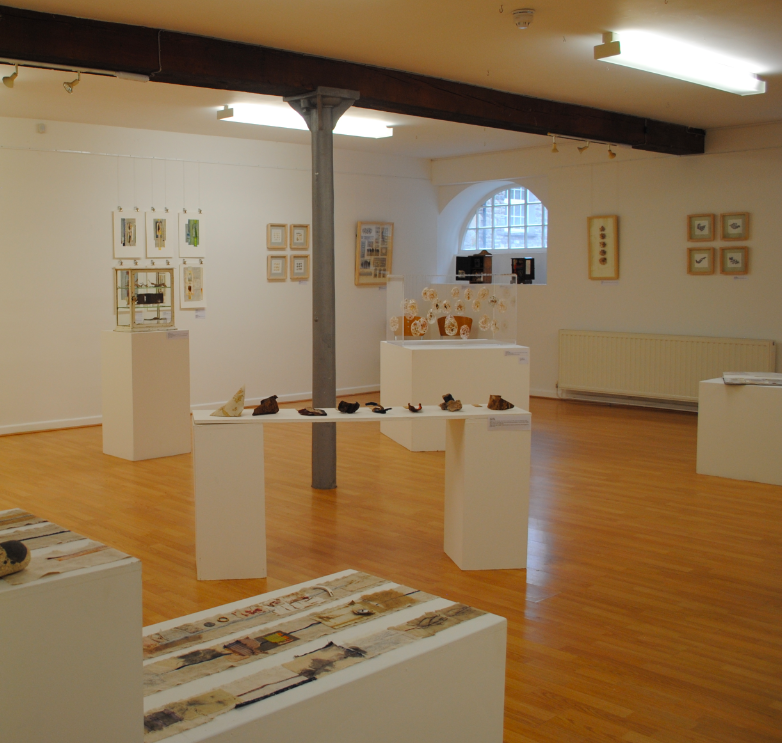 The Howgill, Dover and 2K Exhibition Galleries are also located on Level 2 and feature changing exhibitions throughout the year. Level 4 (above) is home to a numerous collection of floor and hand looms which have been loaned, donated or acquired since it opened to the public in 2001. 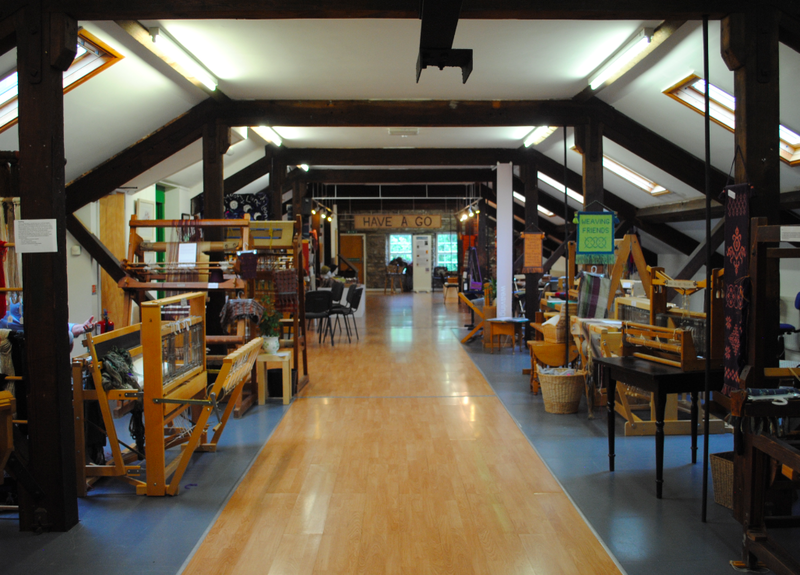 The mill uses wool from Rough Fell sheep on its looms and local lace-makers and rag-rug makers regularly demonstrate their craft during each month. The machinery at Farfield Mill was powered by a big waterwheel when it was first built by Joseph Dover. The water came along a millrace from the nearby River Clough and was led into the mill under an arch half way along the side of the main building. The main waterwheel was replaced in 1896 by Joseph’s grandsons Thomas and Edward. 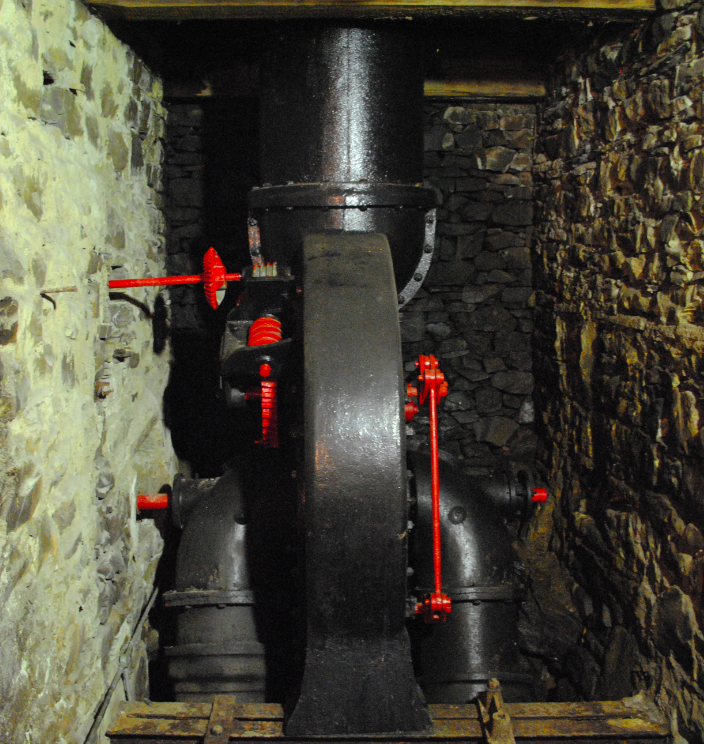 The wheel was replaced with a Vortex water turbine which was manufactured by Gilbert Gilkes and Gordon of Kendal. The company helped to restore the example at Farfield. A steam engine provided extra power from 1911 with an engine shed and its chimney once standing beside the current building. When the insurance became too costly to continue, the building was demolished in the 1960’s. Restored during 2010 with advice from other weavers , a Douglas Andrew 4 shaft counterbalance floor loom with 6 treadles (above) is now in operation at the mill. With the assistance of green threads at each end (holding the shafts steady), initial problems with the loom when working on narrow warps have been solved. The loom has a universal tie up which enables you to work on any pattern without the need to re-tie the treadles. “Our restoration of the building celebrates the achievements, not only of those who lived in the valleys of the Clough, the Rawthey, the Dee, but of all those who lived in the valleys of the northern uplands where the water of its rivers drove the water-wheels which powered iron monsters making cloth for slaves in Jamaica, for coolies in India and for horses in English royal stables. It celebrates men like Will Stainton, who lost the skin off his back while cleaning out the wheel pit and the lining of his lungs from inhaling dust, but who laboured in this mill for 85 years. Yet out of the toil, the tedium and the sorrow came a sense of comradeship and purpose and artefacts of value and of beauty. The tradition is here today where artists work, not in isolation, but in a community: where the work of an artist inspires work of a ceramicist; the work of a weaver inspires that of a goldsmith. The Past Serving the Future. There has been a mill on the site of Acorn Bank Watermill for hundreds of years although the current building dates from the late 18th century. The mill was the manorial mill of the Acorn Bank Estate, also known as Temple Sowerby Manor for a while, and the miller was a tenant. The earliest mention of a mill is in 1323 when the estate passed from the Knights Templar to the Knights Hospitaller and at the time the mill gave an annual income of £4. The machinery suggests that substantial changes were made around 1840 when a French Burr millstone was installed. The original building is constructed of coursed squared rubble with quoins and although primarily a corn mill, the mill has also been used to provide power to the estate gypsum mines. The mill ceased to work in the 1940’s and gradually fell into a state of ruin. 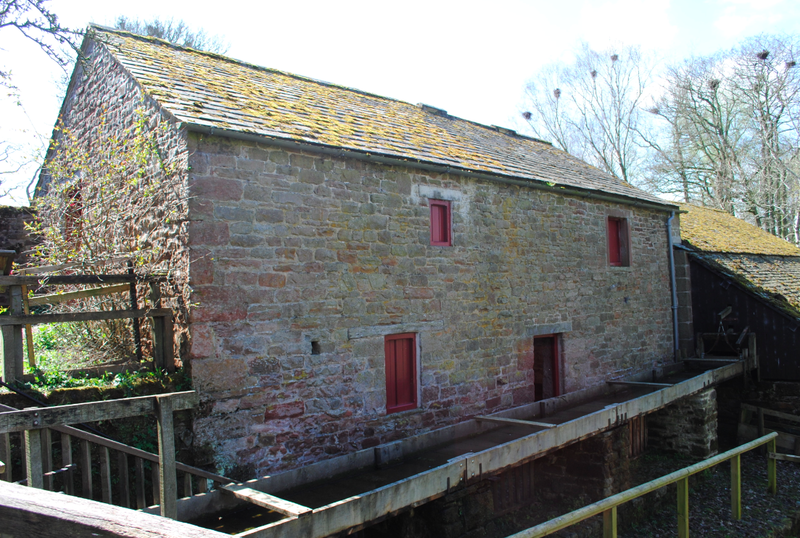 Restoration began in the late 1980’s and the Watermill was little more than a ruin. Many of the walls have had to be dismantled and completely rebuilt yet much of the machinery survived and has been retained. 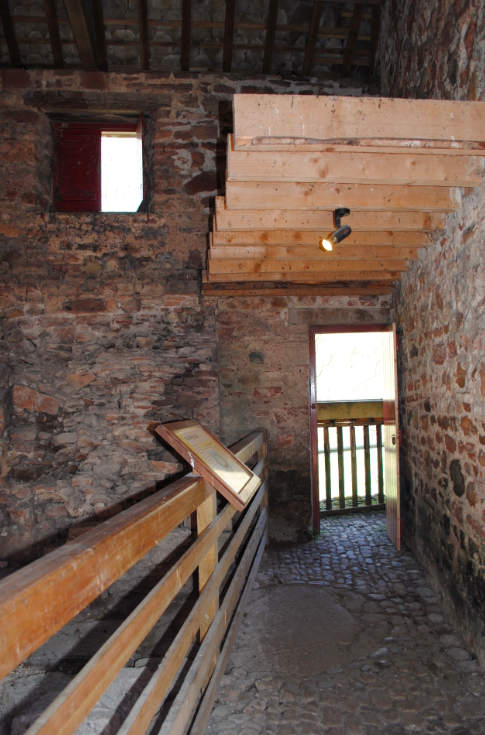 The mill is now partially restored and has been open to the public since 1996. Flour was ground again for the first time in September 2011. The water supply for the mill starts at a weir and sluice on Crowdundle Beck – about a quarter of a mile upstream of the mill. The weir directs water into the millrace and the sluice allows the miller to control the amount of water that flows to the mill. The race has a very shallow fall while Crowdundle Beck drops more rapidly. By the time the millrace reaches the mill, the water in it is about four metres above the river level and high enough to pass over the wheels. Acorn Bank Watermill is unusual in that it has two sets of mill machinery driven by separate waterwheels. 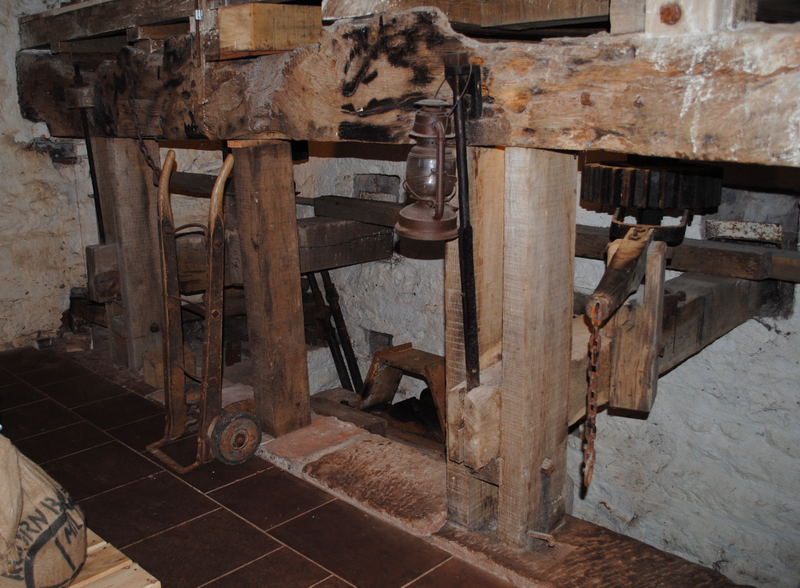 The upper set of machinery (above) is virtually complete with two pairs of millstones for grinding grain and making flour. This set of mill machinery is driven from the uppermost of three waterwheels. 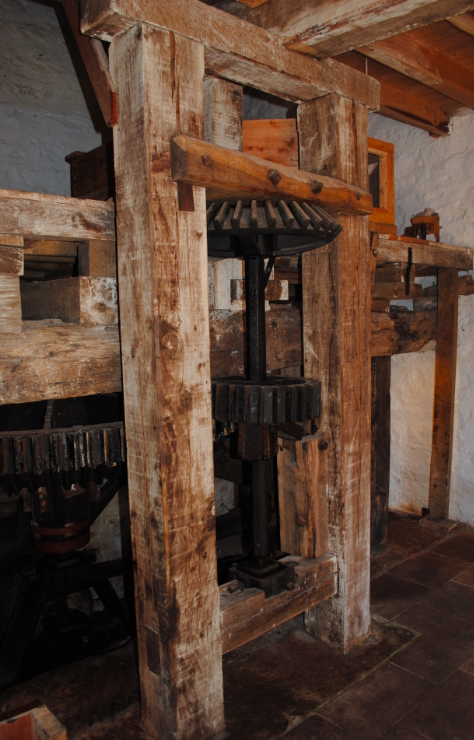 The large vertical cogwheel is on the same shaft as the waterwheel. This cogwheel is the pitwheel and it turns the smaller gear, the wallower, on the vertical shaft. The great spur wheel is the large gear above the wallower and this could be made to drive either or both of the millstones via the small ‘stonenuts’ to each side of the great spur. The lower set of mill machinery (above) is no longer complete but was once almost identical to the upper set. 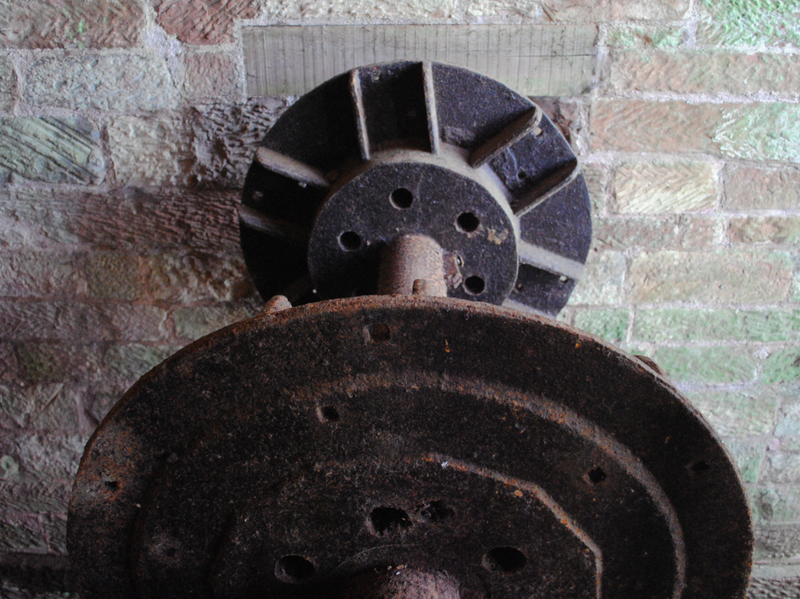 The large cogwheels were probably removed when the waterwheel was adapted to provide power to a local mine. The lower set of mill machinery, like the upper set, has two pairs of millstones and was driven from the middle of three waterwheels. 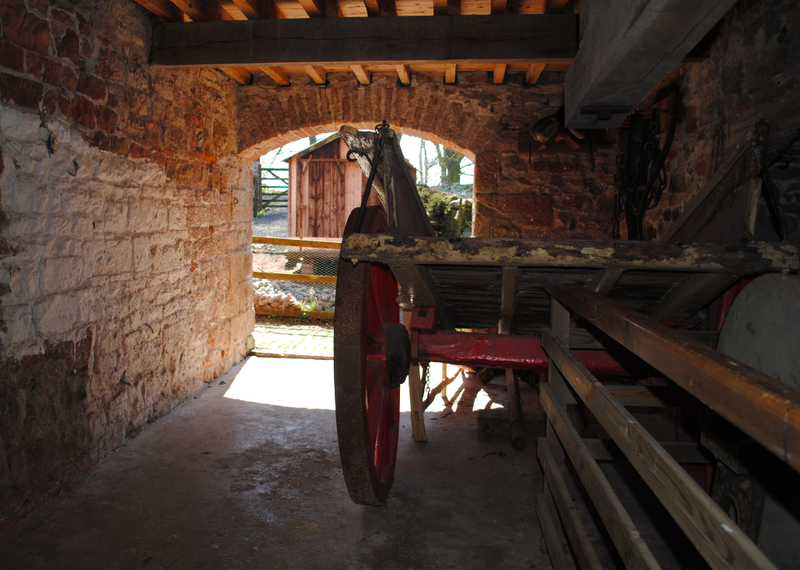 The drying kiln (above) was used to dry the oats before they were milled. A floor of perforated tiles existed above a fire and the oats were spread over the tiles which were dried from the heat of the fire. Suspended above the kiln fire was a baffle plate which spread the heat more evenly and prevented a hot-spot on the floor above. The perforated tiles of the drying floor were supported on cross beams of stone and slate and later, iron. The earliest tiles were made of roughly fired clay with holes punched through. The oats were spread over the floor to a depth of a few inches and were turned regularly to prevent the lower grain burning and to ensure an even drying. The miller would be able to tell when the grain was dry enough by biting it. Once dry, the grain was swept off the drying floor to be milled. There were once three waterwheels at Acorn Bank. The top and middle wheels drove corn milling machinery while the bottom drove a saw bench. The middle wheel was adapted to provide power for a nearby gypsum mine. There were two types of wheel in use at the mill. The upper wheel is a pitchback meaning that the water falls onto the top of the wheel at the back and the middle and bottom wheels were overshot meaning that the water falls onto the wheel at the top. In both cases, the water fills buckets and its weight turns the wheel. 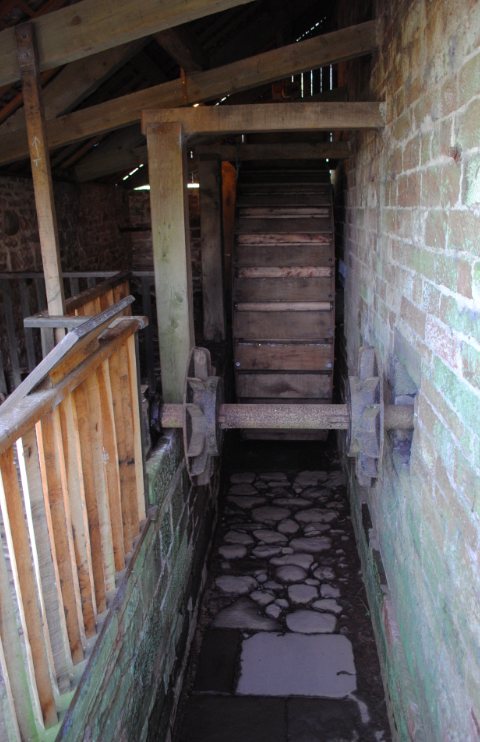 The bottom wheel was situated below the mill building. Acorn Bank Mill is Grade II Listed.